Free Pinterest Marketing Workshop - Master Pinterest SEO Traffic Secrets! Hi! I'm Anastasia and I'm a Pinterest Marketing + SEO Expert at anastasiablogger.com. 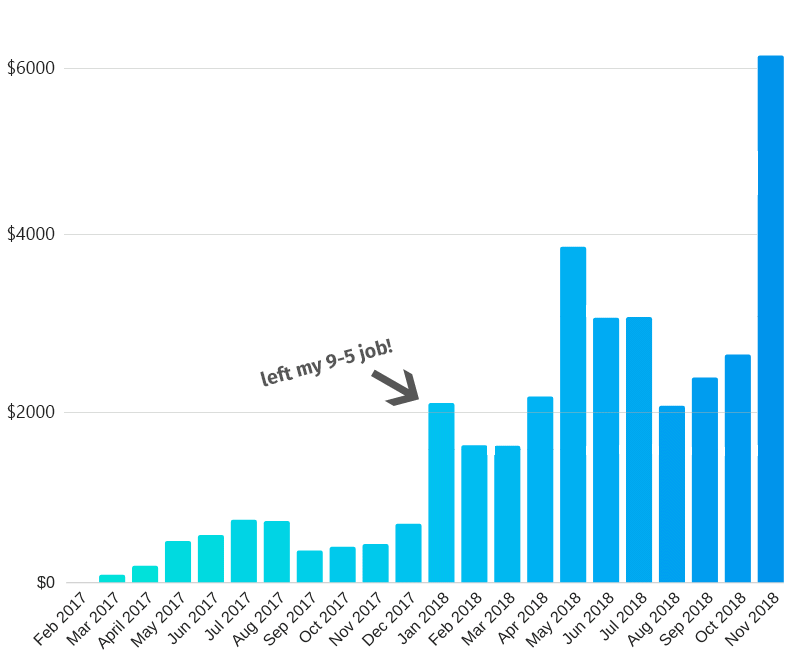 I also call myself Blog/Online Business Growth Hacker because in about one year I've grown my first blog to a point when I was able to quit my job. And my second blog reached 74,000 monthly pageviews in under 90 days! I started my first blog on Feb 15 2017, and in about 10 months I was able to quit my day job to become a full-time blogger. I could never imagine that Pinterest SEO traffic will help me do it so fast! So, here is the deal. I worked some 10-years in online marketing (never worked for myself though), and the word SEO (in regards to Google) was no news to me. But the problem of any new blog or online business with Google nowadays is that you face an enormous competition for TOP search results. Plus, new websites don't have any domain authority and backlinks. To grow these, you need literally YEARS of work. With no guarantees whatsoever. Pinterest is currently THE MOST blogger- and content-creator friendly platform. If you know what you are doing, Pinterest can send you more traffic than Google, Facebook, Twitter, Instagram, combined. 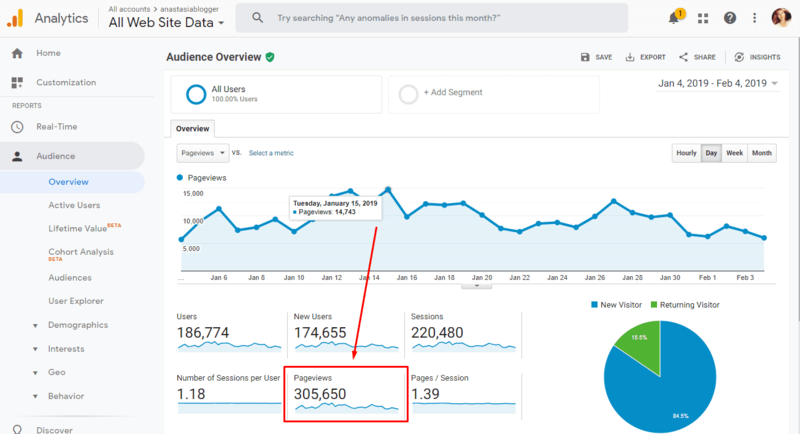 How Much Traffic I Get From Pinterest? Yep, over 90% of all traffic to my blog comes from Pinterest. Here is one of the good days when a pin goes viral - I've got 93 real-time visitors on the site, of which 83 came from Pinterest. Real-time means almost a hundred users on my site simultaneously. 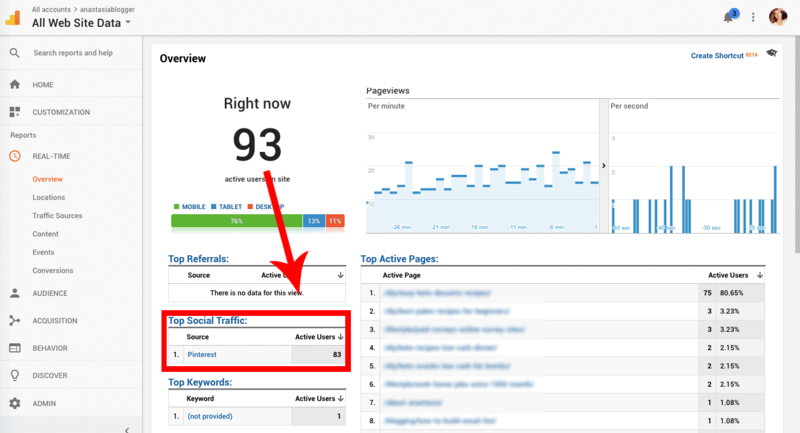 Real-time Pinterest Traffic From a Viral Pin! What Will I Learn in This Masterclass? Pinterest helps Anastasia Blogger drive over 250,000/mo pageviews to her website. To be confident targeting high search volume keywords on Pinterest. To leverage seasonal and Holiday traffic spikes on Pinterest to maximize your income. To create an ideally SEO optimized pin for Pinterest. To craft pin images which generate a ton of engagement (without Photoshop! ).